BAM is part of Oracle Fusion Middleware stack and it is used for monitoring and reporting purpose. There are different ways to link Oracle SOA suite to BAM, one of it is BAM adapter. In this post, we will discuss about BAM adapter and do the configuration. BAM adapter is used to do the monitoring at composite level. When we want to monitor full message we usually use BAM adapter but for variable and activity monitoring we use Sensor and Sensor actions. To add the BAM adapter to your composite, go to Service Adapter and choose BAM Adapter and drag it to composite. 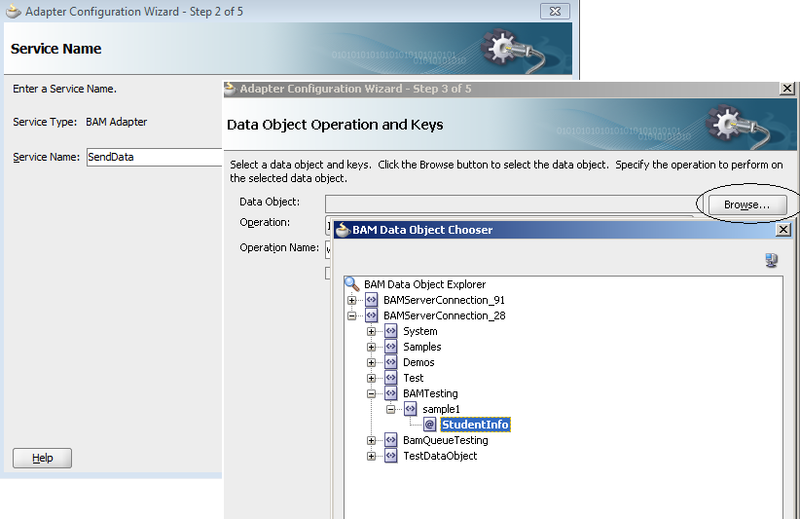 Provide Service name and choose BAM Data Object by clicking on browse button. Make sure BAM server connection is already there in your Jdeveloper and required BAM Data Object is already created in BAM. Once you choose the Data Object then you need to choose the required Operation. We can choose one operation from below list. Since we choose the upsert, so we need to choose the fields that we want to Insert + Merge in Data Object. Now we need to configure the JNDI that we will use for BAM Adapter. Go to admin Console. Click on Deployment. Go to OracleBamAdapter and then click on Configuration Tab. 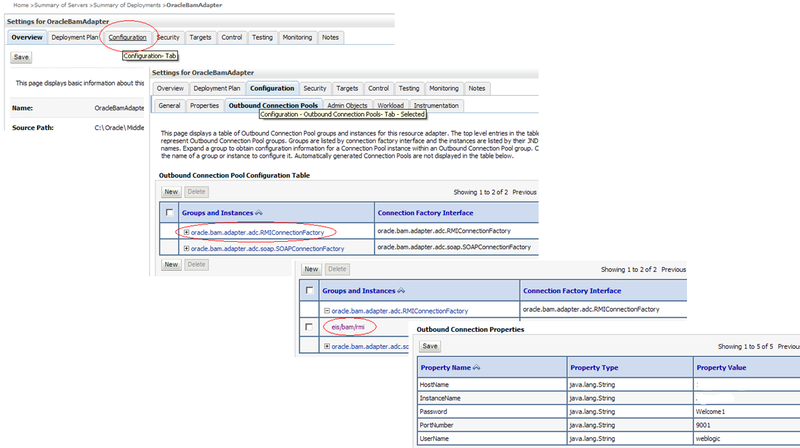 Open “Outbound Connection Pool” tab and expand RMI Connection factory. Click on eis/bam/rmi. Enter all the required values and clicks save. Here you need to enter BAM server details. Make sure you update the OracleBAMAdapter in deployments once you are done with above changes. Now we can use “eis/bam/rmi” in our Bam adapter to connect to BAM server. Click Finish. Your BAM adapter is configured to connect to BAM server.